Have you just moved into a new home in Suwanee or the surrounding area and don’t like the look of your garage door? Have you had the same garage door for years and feel like it’s time for a change? Whatever your reason for wanting a new garage door, Nabors Garage Doors is here to help as your Top Rated Local® Garage Door Installation Company. 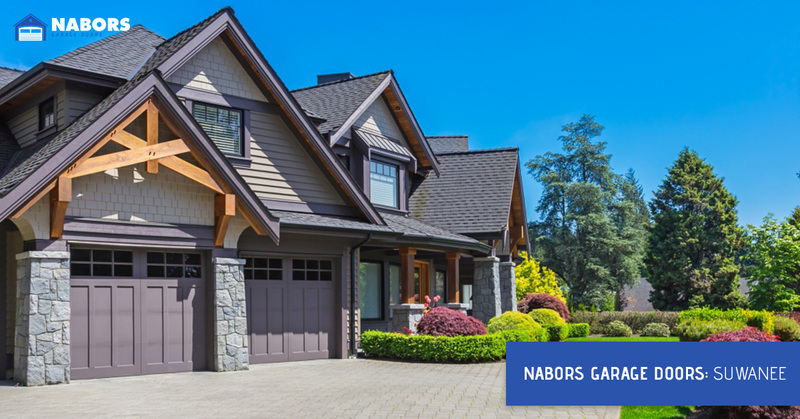 For years, Nabors has supported Georgia with friendly, reliable, and cost-effective solutions to their garage door needs. We help with garage door selection, installation, replacement, repair, garage door opener installation, and much more. Purchasing and having a garage door installed is a long-term solution that will impact both your home’s curb appeal and its functionality. It’s important that you get a garage door that is the right color and style of your home and your personal preference without sacrificing its efficiency and functionality. Nabors job is to make you feel secure about your decision all while providing you with the best price on the market. We’re so confident in our services that we will match any other company’s prices, should they offer a lower price than us. What do you have to lose? Contact us today! Our traditional Amarr steel garage doors are a simple, yet aesthetic garage door for your Suwanee home. They come in six different colors and have countless window and panel options so you can get exactly what you’re looking for. Our Amarr traditional garage doors are some of the most popular and reliable garage doors on the market. Our carriage style garage doors come in both steel and wood. From a distance, they give off the appearance of a carriage house door but actually function exactly like a standard garage door. This is great for country style homes. Nabors specialty garage doors are made of aluminum and iron and resonate perfectly with modern style homes. These are not as popular as our other garage doors but will surely give your home a unique and stylish look. Selecting your garage door style is important and will have an impact on your home’s curb appeal and overall appearance for years to come. If you need help selecting a garage door for your home, don’t hesitate to contact us to learn about the benefits of each. Whether you’ve just moved into your home or you’re preparing to sell it, it’s important to have a lasting solution and plan for an aesthetic and functioning garage door. When you need garage door services for your Suwanee, Georgia home, there’s nobody better to call than your Top Rated Local® Garage Door Company at Nabors Garage Doors. We’re proud to have served our local Georgia community and look forward to doing so far into the future. If you’d like to learn more about the services we offer to our Suwanee clients, visit our website. Contact us today if you need garage door installation or repairs.